I went to buy a beginners Quranic Arabic lesson book for my youngest child and came across this book. It’s generous (almost A4) size and attractive cover encouraged me to take a look and the idea, introducing children to hadith, piqued my interest. 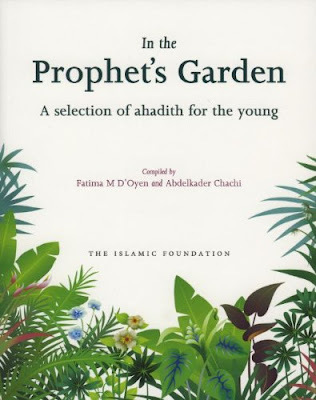 The book is divided by theme: faith, prayer, Ramadan, repentance, parents, manners, sins etc with an introduction about the Prophet Muhammad (peace be upon him). There is also a small introduction to ahadith: what they are, their importance, their collation and the value of learning them. The hadith in the book are written in Arabic and then in English. My children would not be able to read the Arabic well enough yet, but I felt it was good to have the Arabic next to the English for them to understand the relationship between the Arabic language which they are learning to read, but don’t yet understand and the English. My children regularly sit with me in halaqa’s or study circle’s, but the majority of these are in Urdu. So they understand some, but not all of what is said. It was gratifying to find the hadith translated into fairly simple English. The pilgrimage is to be held in the well-known months. Whoever intends to perform it at that time (should remember that) there must not be any sexual contact or improper behaviour, nor abuse, nor angry conversation while on the pilgrimage (al-Quran 2:197). Aside from this though, I found the content accessible for my children, at a level where I could read to my sons (aged four and six) and at which my daughter could read through herself (at aged eight). I was definitely pleased to have purchased this book and will be sharing it with my children.